When I thought of Laos, I was pretty much ready to rough it out backpackers’ style like many Southeast Asian countries we’ve travelled. 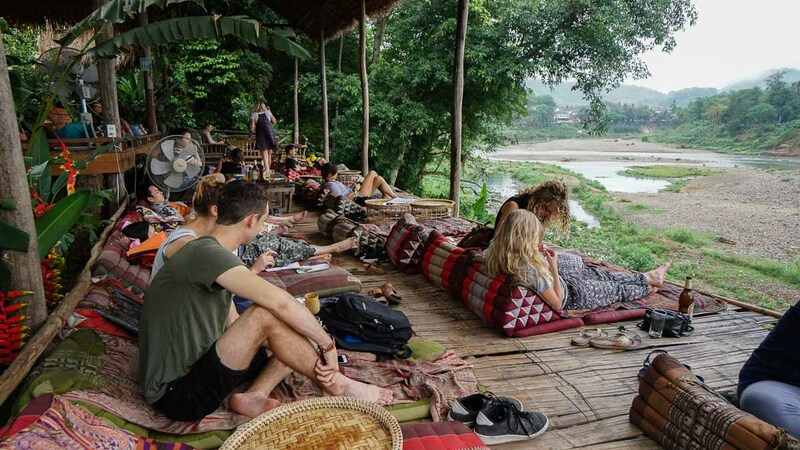 While it’s indeed on many bucket-lists of backpackers passing through Laos, Luang Prabang’s easy access to good food, cosy accommodation options and only a short 4 hour flight away makes it a perfect option for a quick getaway from Singapore. We walk out of the airport, bracing ourselves for the hustling taxi drivers we’re used to in so many Southeast Asian countries only to find none of it. There wasn’t even much of a crowd outside. Data SIM card booths outside sell a range of plans and we settled for the 2GB plan for US$5. We also purchased the 7 day unlimited plan for US$8 but the speed ran more like GPRS; not sure if I was just unlucky but I wouldn’t recommend the unlimited plans. Laotian Kip is hard to find outside the country so bring US dollars and exchange them once you land. The airport’s rate was actually better than what’s offered in town. We finally head to the taxi booth with fares stated clearly — flat rate of 50,000Kip (S$8) to town for up to 3pax. It felt good to not have to hustle our way out of scams in the first few moments landing in a brand new place. Landing at 5pm local time, famished, we headed straight for the local night market on Sisavangvong road once check-in was settled. We stopped by one of the stores selling noodle soup, a couple of locals slurping up their bowls. We ordered Khao soy — a mildly spicy tomato based noodle soup for 15,000kip (S$2.50) which kind of resembles a Northern Thai and Burmese dish. Further down in an alley next to Indigo house — the only 4 storey building in Luang Prabang — we were delighted to find more food! 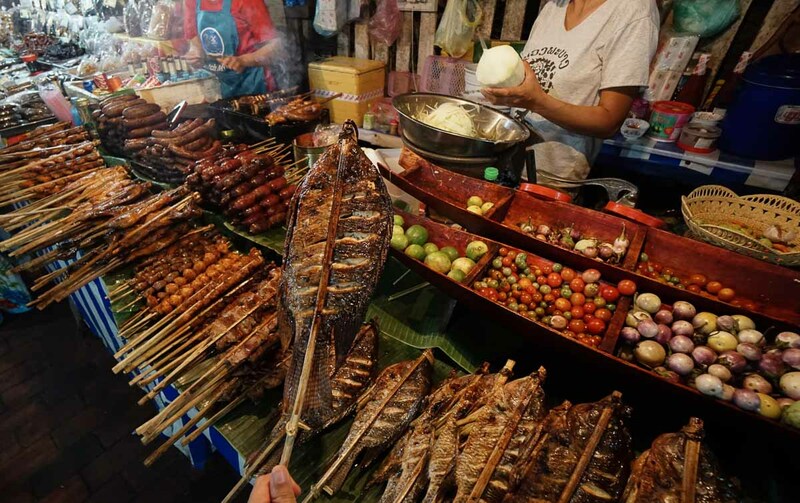 Grilled fish on skewers, chicken wings and other meats cost between 10,000–30,000kip. 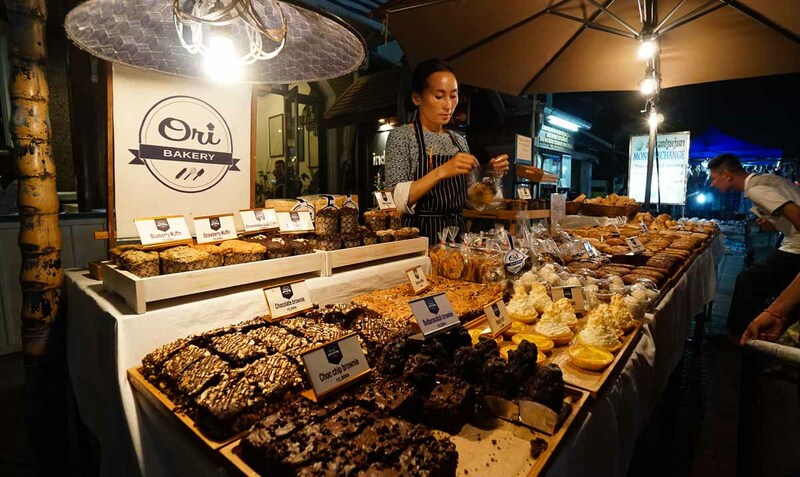 If you’re craving for something sweet, try the mini coconut pancakes or grab some pastries from the Oui bakery in front of Indigo House — I loved the banana cake! Down the lengths of Sisavangvong road, you can do a bit of shopping for clothes, bags, scarves, pouches but one interesting store actually sold metal cutlery, bottle openers and keychains made out of bomb scraps left during the civil war. Further down the same street, there’s a handful of tour operators selling popular day tours and adventures. 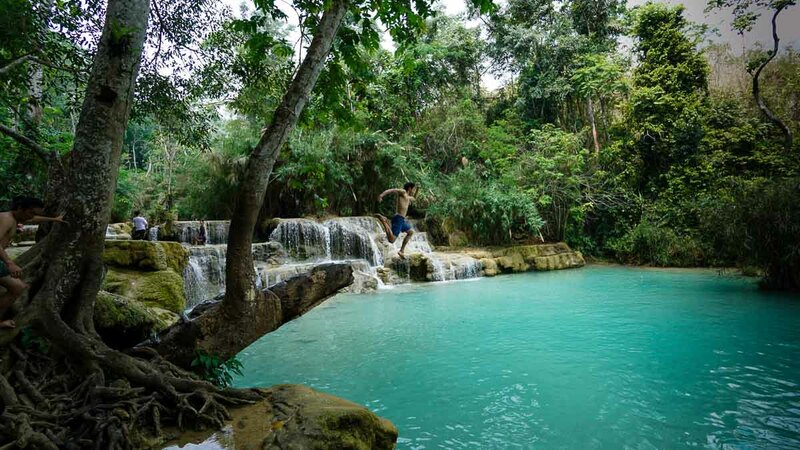 The common ones are trips to elephant sanctuaries, zip-lining, village stays and of course, a trip to the famous Kuang Si waterfalls which is every travellers’ must-see item in Luang Prabang. You can sign up at one of these places or check for information and book them direct through the website. The night market starts packing up around 9:30pm but if you’re not ready for bed yet, there’s a really cosy bar just a 3 minute walk from the night market — 525 Cocktail bar. 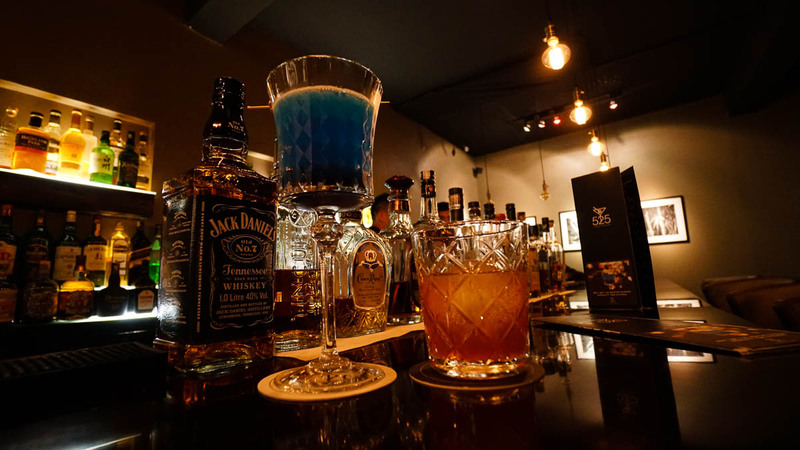 Bartenders speak a bunch of languages and are more than happy to entertain. Some of the popular recommended drinks here are the pineapple ginger mojito, 525 Evening Sky (blue in image above) and their ‘New’ Old Fashioned. 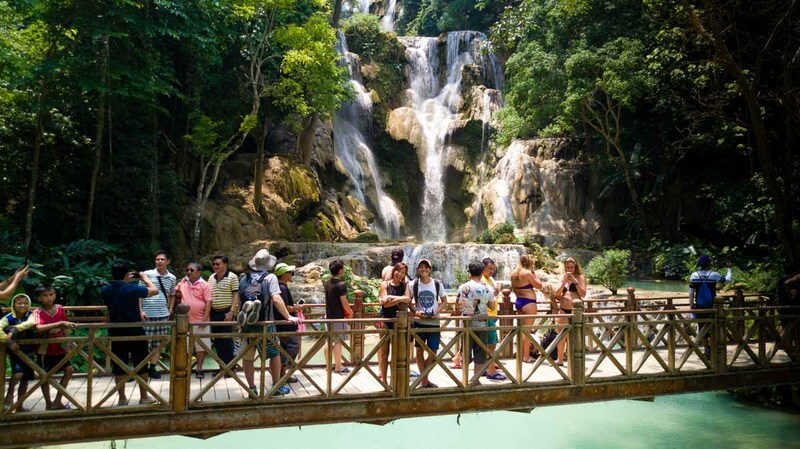 8:30am — Craving for a little nature & adventure, we signed up for a full day trip to Hoi Khua waterfall with the company Lao Green Group. Surrounding the waterfall is an adventure park with rope courses and zip-lines. We learnt that the land was previously owned by the Hmong tribe but under-utilised. Hence, the owners saw the opportunity to create a space accessible to travellers while still being able to preserve the nature that surrounds the 30 hectares of land. 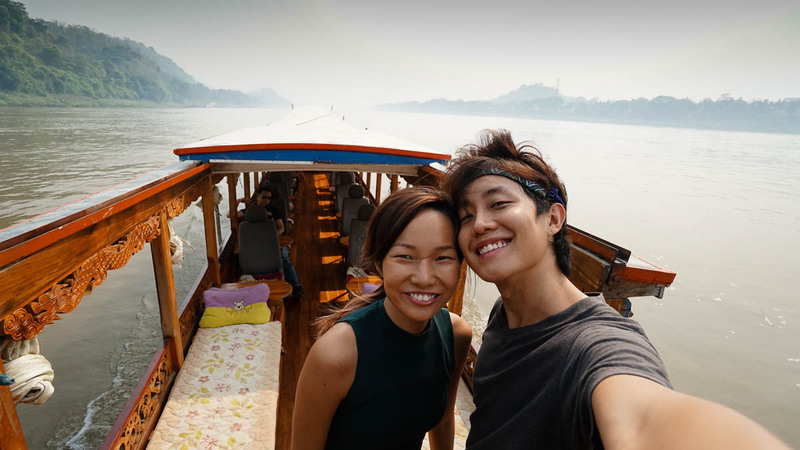 Included in the package is a slow ride in a long wooden boat down the Mekong river followed by a short bumpy ride on the back of a pick up truck before reaching the waterfall. 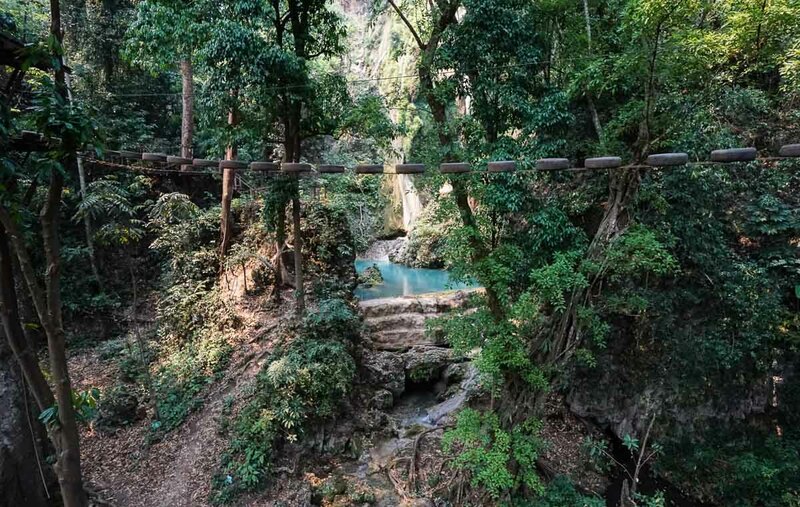 There’s really so much to do in the area: trek to the top of the waterfall, test your agility on the rope courses, zip-line through the forest and end off with a refreshing dip in the pool down by the waterfall. You just can’t help but feel like a kid again in a place like this. April is one of the hottest times of the year in Laos; right before the start of the new year and the monsoon season, so we were eyeing the pool beneath the waterfall the moment we got here. And the best part is, there was barely anyone around! By the time we returned by boat, it was around 5pm and the sun was setting nicely along the river, just in time for dinner! 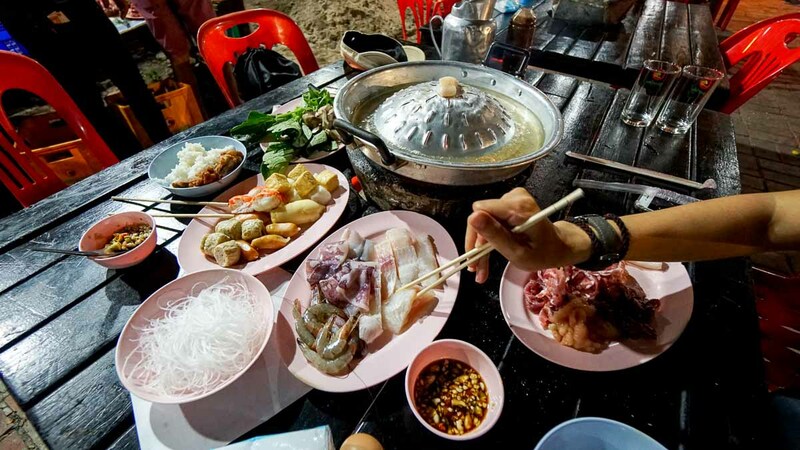 For dinner we found an outdoor Riverside Barbecue Restaurant right along the Mekong river near where we docked. One local mentioned it was a Laotian kind of barbecue but it really just resembled a Thai mookata — I guess there’s just a lot of cross cultural influences around here. Regardless, a buffet style mookata for 60,000kip (S$10) is a pretty good deal! 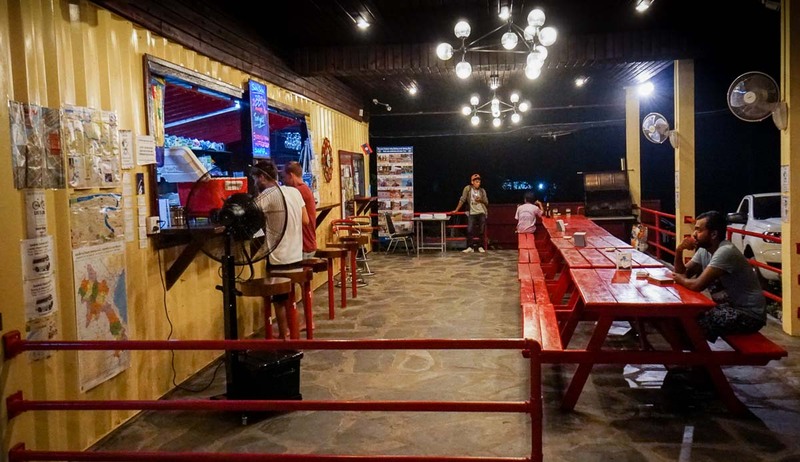 You can also get a Lao beer here for 10,000kip whereas most places around the night market and at hostels will sell it for 15,000kip. With plans to visit Kuang Si waterfalls early the next morning, we popped by one of the motorbike rental shops between Chao Fa Ngum Road (same as the night market) and Khem Khong Road (right next to the river). These shops usually close around 9:30–10pm. The bike rental here is pretty standard at US$10-15 for 24 hours. 7am — Got out early and rode the bike to Kuang Si as we heard it gets crowded really quick. If you’re not confident of riding your own bike, there are lots of tuk tuks that will bring a group of 4 there for 200,000kip both ways. It was a pretty scenic 45 minute ride through villages, padi fields and tall trees. 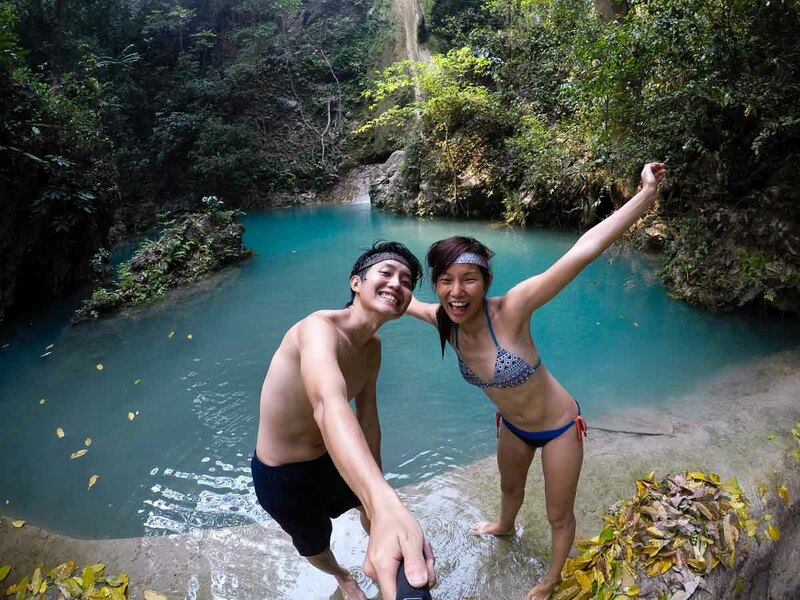 Kuang Si is made out of a series of cascading waterfalls with 3 main sections, each with a pool area to swim in. The first you’ll see is the one with the branch and is where you’ll find everyone jumping off. The water can be quite shallow so watch your feet! The top is where you’ll see the tallest part of the waterfall but the bridge is also where EVERYONE takes photos at. *Pro-tip: Head to the bridge at the top first thing first if you get here early. If you’re up for a bit more adventure, there are paths on either side of the waterfall where you can get to the top. The right side is shorter but steeper and can be quite slippery. From the top, it’s a lot more chill and a lot less crowd. There’s a swing hanging off a branch and you get a panoramic view from the top of the waterfall. Before you leave, don’t forget to check out the bear rescue centre included in your entrance fee into Kuang Si. These bears were saved from illegal medicine trading where they were malnourished and trapped in small cages. At the Tat Kuang Si bear rescue centre you can see them roaming around playfully taking a jab at each other or just lazing on the platforms. 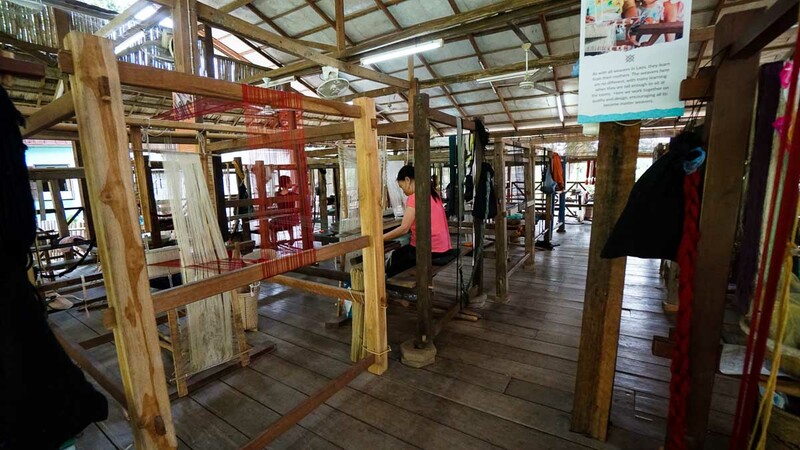 On the way back to the city, we stopped by the Silk Road Cafe owned by Ock Pop Tok — Luang Prabang’s most famous textile centre which sells quality textiles as well as conducts lessons for foreigners who want to make their own. 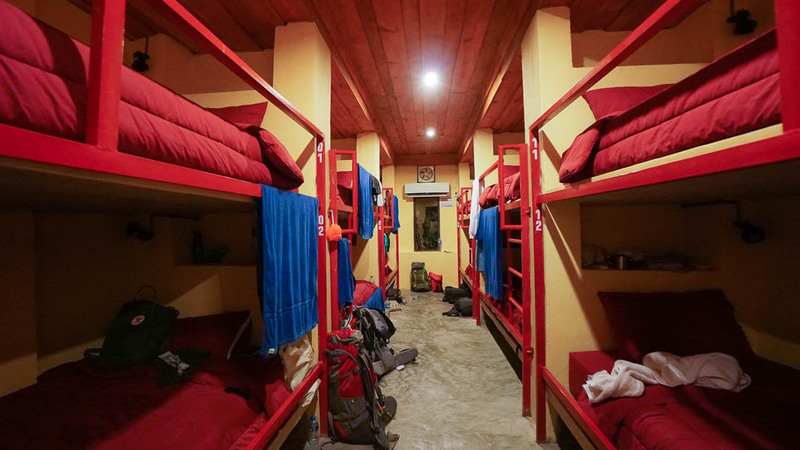 Apart from the textile school and shop, Ock Pop Tok owns 4 cosy units of accommodation right by the Mekong river. Each room is decorated by textiles unique to the different Lao tribes. It’s a little far from the city but there’s free tuk tuk shuttles and bicycles for rent — and to be fair, Luang Prabang is really small so it doesn’t hurt to take a bit of a walk. 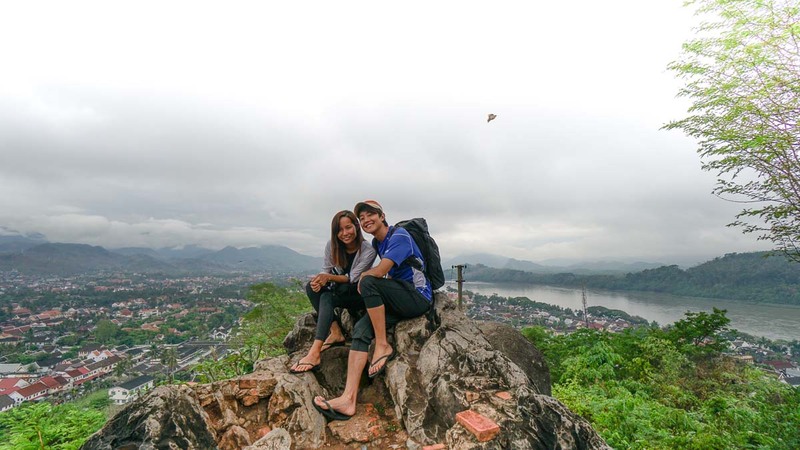 Mount Phousi (really more like a hill) is another place everyone visits at least once in Luang Prabang and it’s no mystery why because the views from the top are spectacular! It gets crazy crowded between 4-6pm since it’s also a great spot to catch the sunset. But since the weather wasn’t the best that day we decided to go a little earlier and we’re glad we did! Same awesome view sans the crowds. 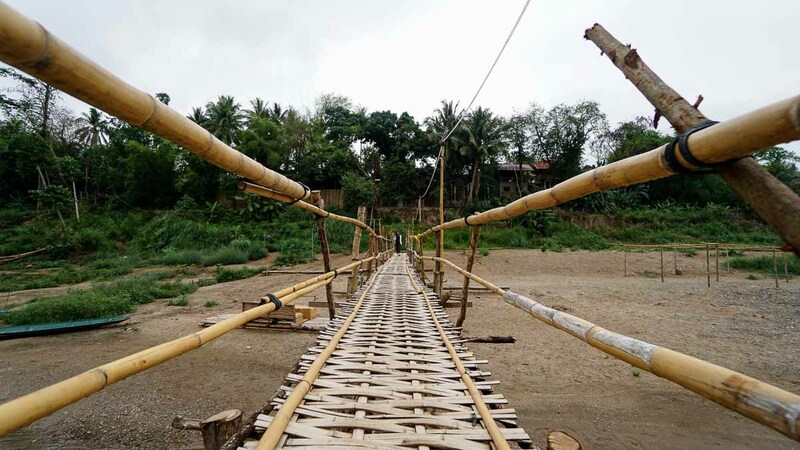 If you’re visiting during the dry season (October – March), you should be able to catch this scenic bamboo bridge across the Nam Khan river. Fun fact: this bridge gets swept away by the monsoon and rebuilt all over again every year. There’s a 2,000kip fee for crossing but that’s to fund the annual repair of the bridge. After spending the last few days hunting for adventures on the outskirts, we spent our last day finding some of the best spots to chill in the city. 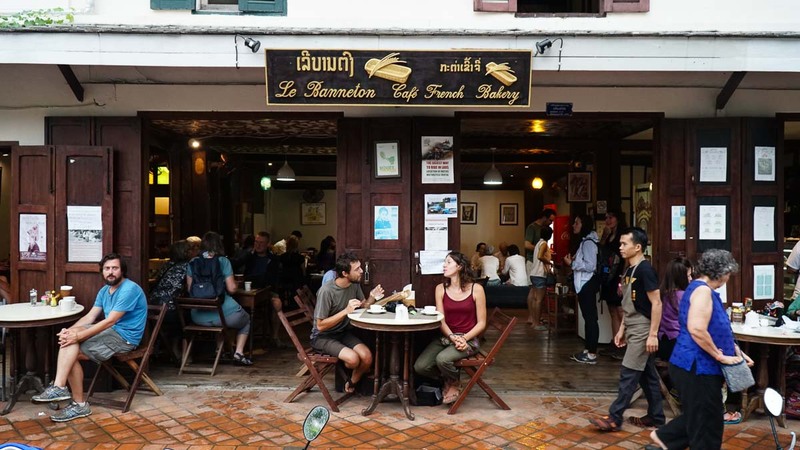 Luang Prabang has pretty strong influences from the French as seen in a lot of the architecture. 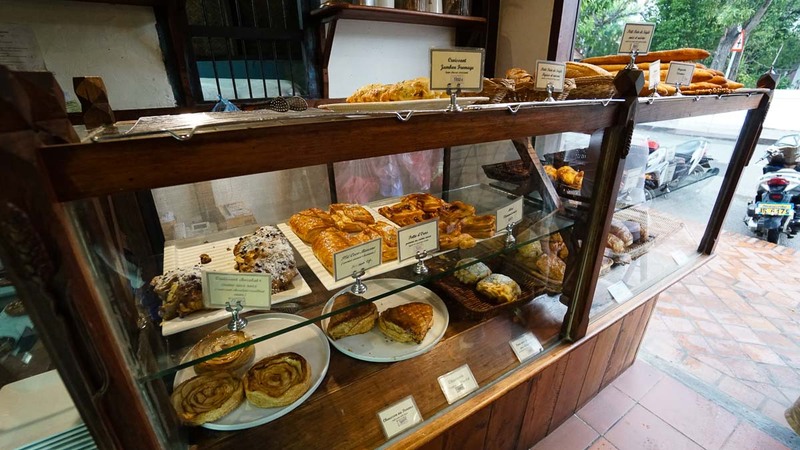 So it’s no surprise that baguettes, and french bakeries are found around the city. Le Banneton is one of the more popular ones and their croissants get sold out by 10am on some days. Other popular cafes around include Saffron, Joma and if you’re feeling fancy, Cafe de laos serves coffee in a Siphon apparatus. 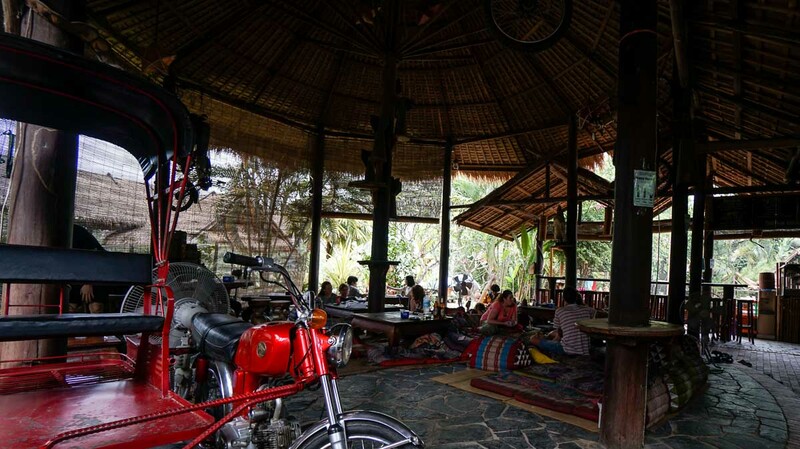 Another great cafe to really chill out is Utopia. 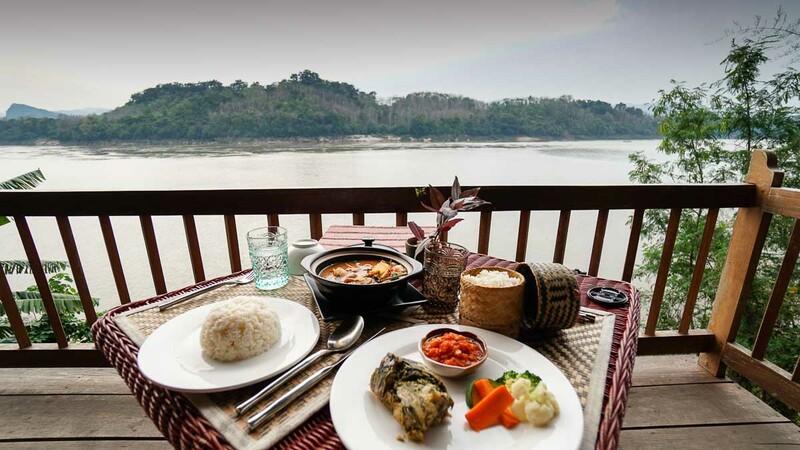 Over looking the Nam Khan river, it’s a super zen cafe in the day which even offers 7am yoga lessons every morning. But by night, it turns into a pretty happening bar. For our last lunch, we found an interesting restaurant called Tamarind. 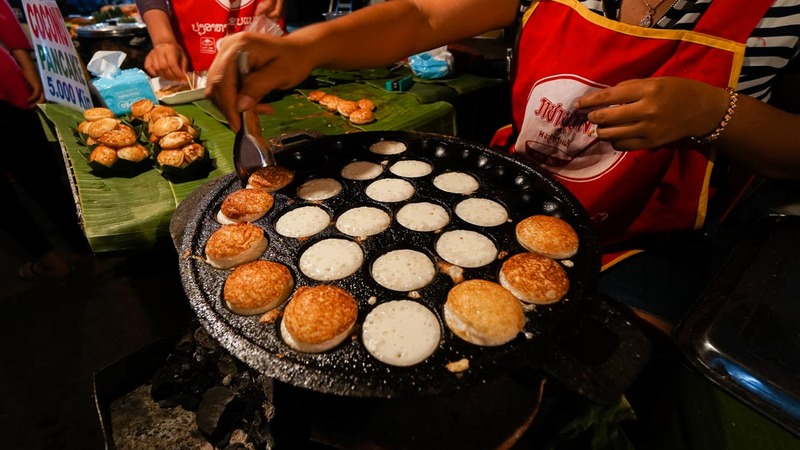 Run by a local and his Australian wife, the menu has quite a comprehensive answer as to what Lao people really eat. 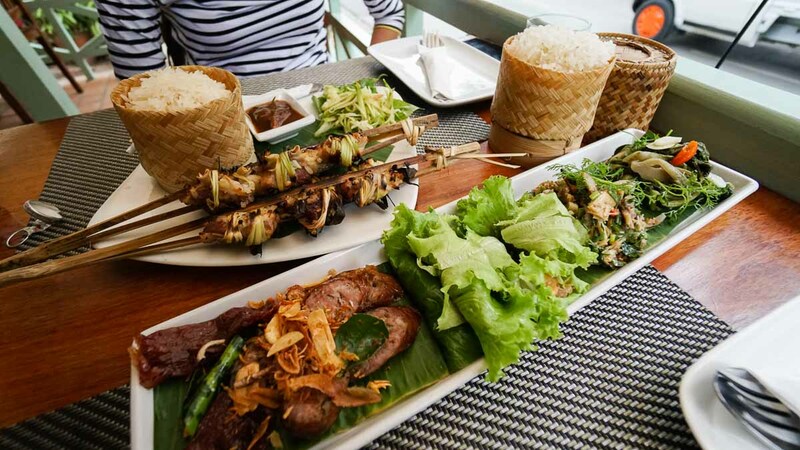 After having a mish-mash of Vietnamese Pho, French baguettes and Thai mookata, we were quite curious what traditional Lao cuisine was. We ordered Five Bites which comes with bite sized portions of 5 different Lao snacks — a lot of which were quite salty on its own but went really well with a side of sticky rice. With some time to spare before our 5pm flight, we settled in one of the many massage shops* scattered along Sisavangvong before leaving for the airport — a great end to the trip indeed. 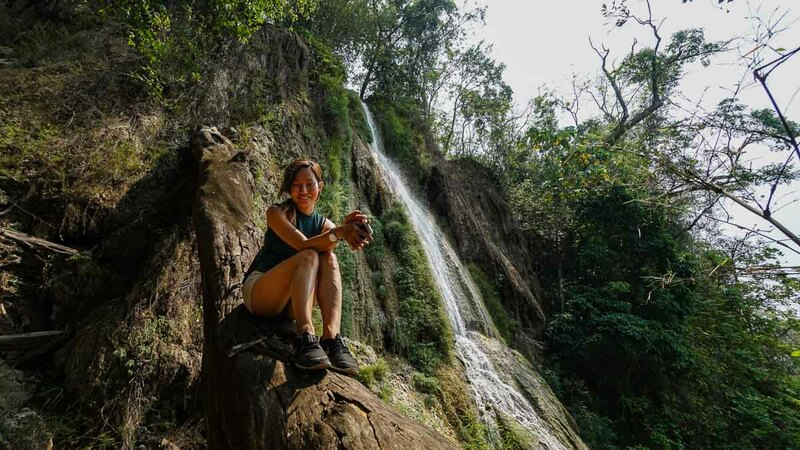 The great thing about Luang Prabang is how fitting it is for both the budget backpacker as well as those looking to spend an extended weekend away in comfort. 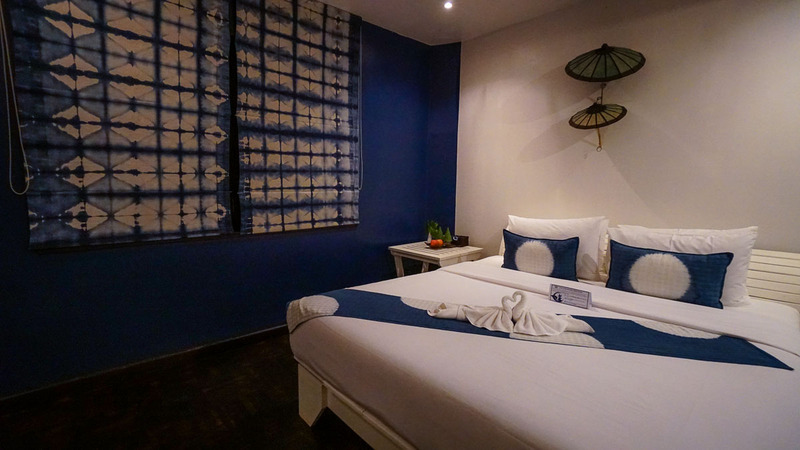 Located right at the start of the local night market, the 4 storey building of Indigo House is unmissable. If you realise, it’s the only 4 storey building in the entire Luang Prabang because it was built before Luang Prabang got its UNESCO title that set a law for all buildings to be a maximum of 2 storeys high. Which is great for guests at the Indigo House as you get to enjoy views of the city from the rooftop terrace. The rooms are extra cosy (for Laos standards) and the breakfast is really decent. You get to choose from a menu of 7 options with 2 local dishes and 5 western styled breakfasts ranging from yogurt and muesli to a hearty american breakfast. 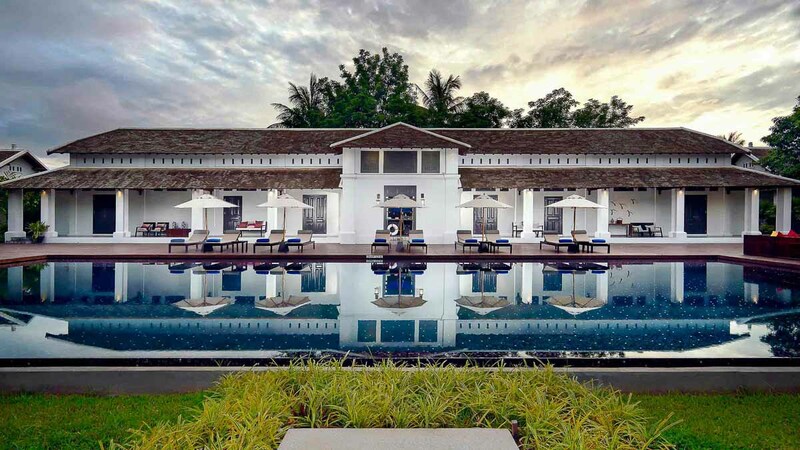 We obviously didn’t make it here but if you’re looking for a splurge, Sofitel Luang Prabang is the most luxurious hotel in the city. From private pool villas to suites with a gorgeous garden views, you’ll definitely feel pampered at the Sofitel Luang Prabang. *Pro-tip: Purchase your tickets with the new KrisFlyer UOB Debit card to chalk up more KrisFlyer miles! Traditionally apart from flying, you could only earn KrisFlyer miles through spending on credit cards. Unfortunately, this option is out of the question for those still studying, or before one’s annual incomes hit the minimum requirements for miles credit cards. But with the new KrisFlyer UOB debit card & account, you can now earn KrisFlyer miles when you spend a min. of $500 on the card and save with a minimum deposit balance of $3,000 in the account. With every tier of savings, you get to earn bonus KrisFlyer points that can give you between 1.4 to 5.4 KrisFlyer miles for each dollar spent. 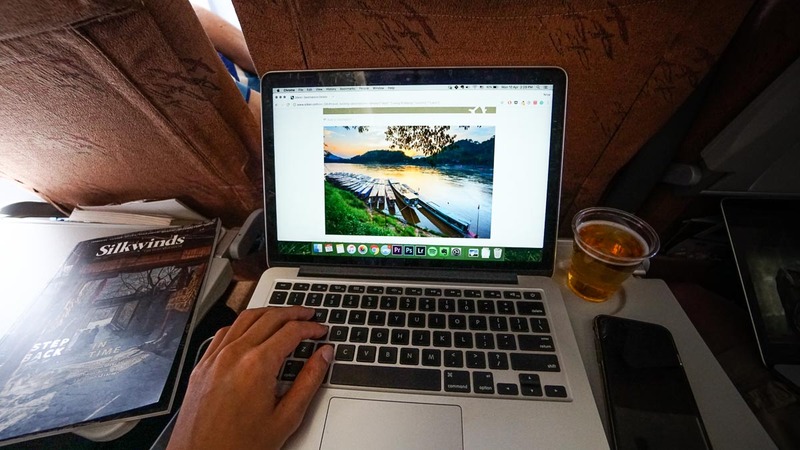 For example, if you’ve a monthly deposit balance of $20,000 and a monthly spend of $750, within a year you could redeem a flight to regional destinations such as Manila, Hanoi, Siem Reap, Phuket or Bangkok on Singapore Airlines or SilkAir. To calculate where your daily spending and savings can take you, check out KrisFlyer UOB’s handy miles calculator. Apart from that, enjoy perks on budget airlines Scoot and Tigerair, such as priority check-in and boarding for you and your fellow travellers, and additional 5kg baggage allowance when you purchase up to 35kg of baggage allowance. T&Cs apply though. Find out more here at UOB KrisFlyer. Love your blog. 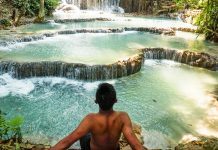 I am looking for a trip this July 2017 and was considering Laos. One question, how do you travel around the city? 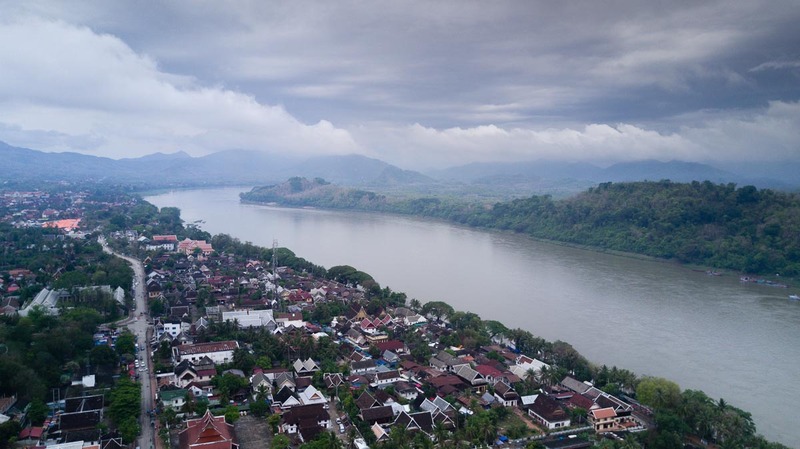 And were you based on Luang Prabang and did a day trips to these places? Hello! 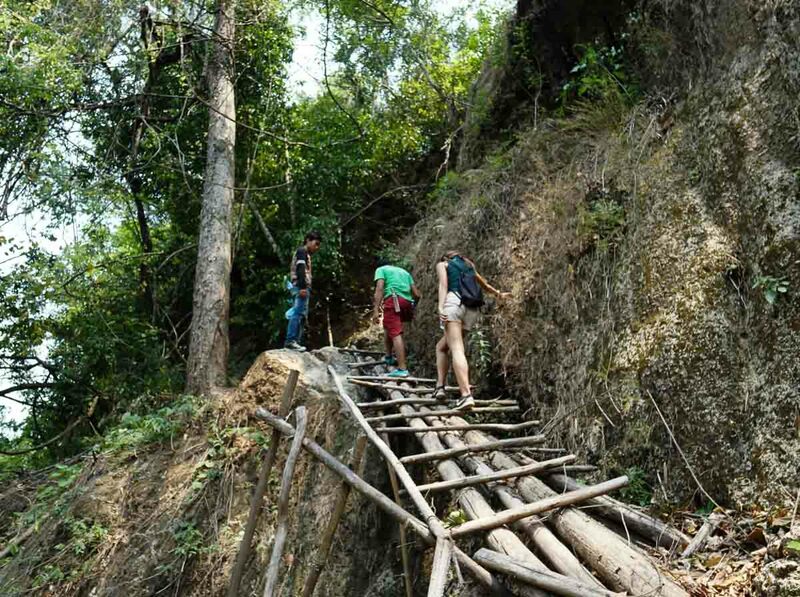 You can easily take day trips from Luang Prabang. There are many tour agencies around that can help you arrange. Alternatively you can contact the zipline company yourself and they will send a transport to your hotel. For the Kuang Si waterfall, you can either hire your own tuk tuk, go with a local tour agency (there are many), or rent a scooter like we did! Is it easy to get lost in your way though? How did you manage communicating with the locals — easy? The town is really small! But if you drive out I suggest getting data so you will have data to use Google Maps. Locals in the tourism industry will speak English! But the vendors on the streets might only know limited words. We never faced any problems. Hi! 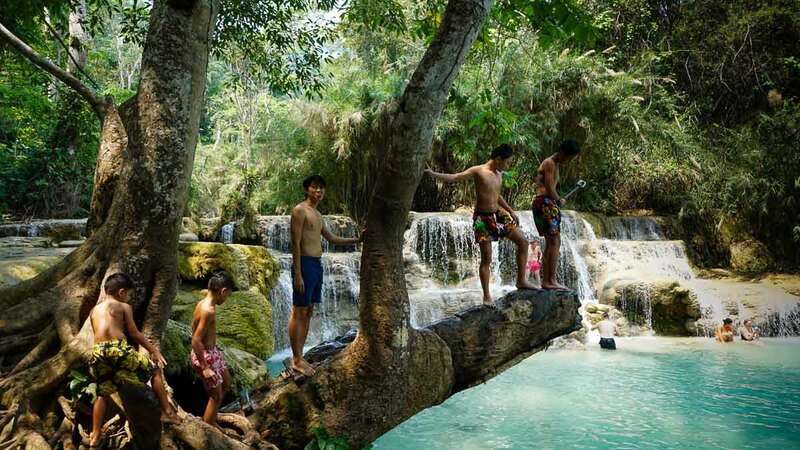 I am planning to go to Kuang Si Falls via a tuk-tuk, then a ride on a slow boat going back to Luang Prabang. 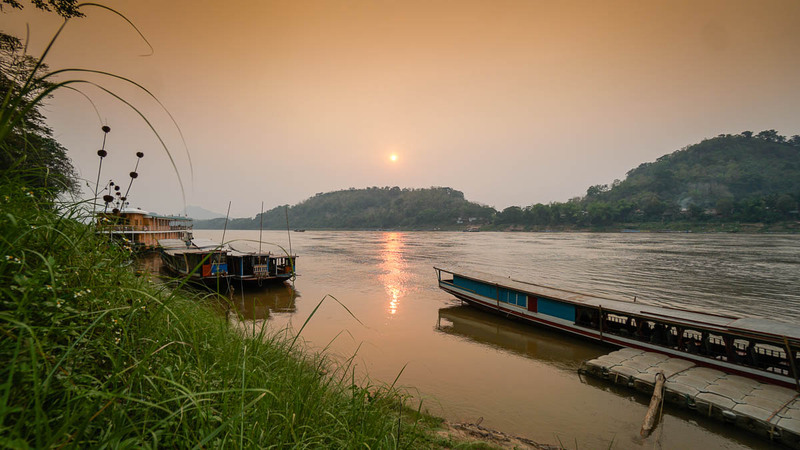 Do you think I can easily get a boat to Luang Prabang without booking a tour? Thanks! Hi Clarisa, Unfortunately we are not too sure about that! 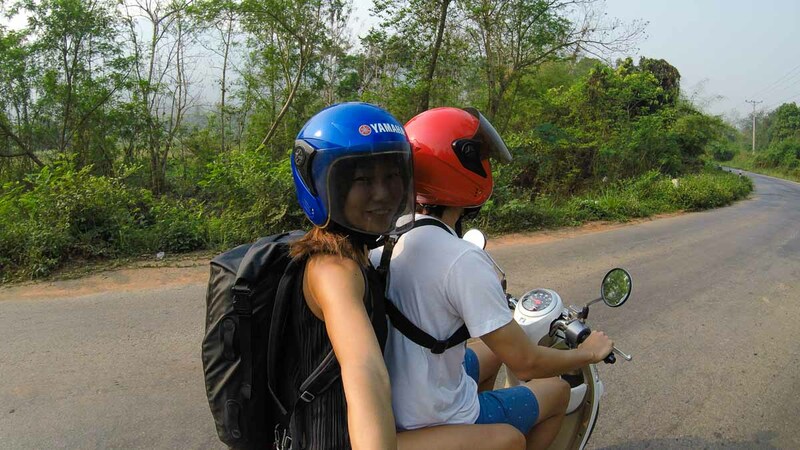 Usually the tuktuk drivers will prefer 2 way transport. Thank you, extremely useful. Going there this December with my hubby.